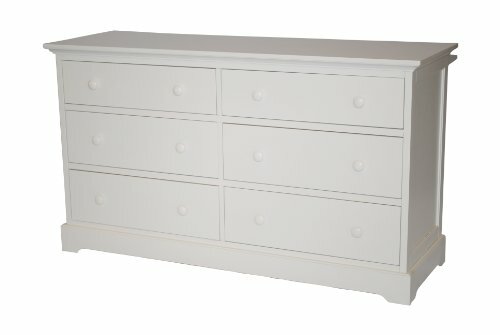 With 6 large drawers, this double dresser from the Chesapeake Collection of children's bedroom features smooth lines for a simple modern appeal. The dresser features 6 drawers, giving you plenty of room to store your belongings. It is sure to be a beautiful and elegant addition to your nursery.Perfect for your nursery roomJPMA CertifiedMade with woodContemporaryDresserAssembledFeatures 6 drawersWhite finishDimensions: 60 x 20 x 34Please note: Orders of 151 pounds or more will be shipped via Freight carrier and our Oversized Item Delivery/Return policy will apply. Please for more information. If you have any questions about this product by Munire, contact us by completing and submitting the form below. If you are looking for a specif part number, please include it with your message.